•	Are MYG Mega-You-Grow products available anywhere other than MYGTech.com? •	Where do you ship your products to? •	How do you package and label your products? •	Can you ship the MYG products to PO Boxes? •	What strains of mushrooms can I grow with the MYG Mega-You-Grow mushroom kits? •	How many mushrooms typically grow using the MYG mushroom kits? •	My MYG mushroom kit has finished its first growing cycle. If I want to use my MYG mushroom kit to grow another crop of mushrooms, do I have to purchase an entirely new kit or can I buy replacement parts and refill kits? •	Can I order bulk quantities and do I get a discount for bulk purchasing? •	Do I need to sterilize my MYG grain jars before using them? •	What is the best way to store my MYG grain jars, straw substrate bags, casing soil and casing starter components? •	The casing soil in my MYG kit has white/grey patches in it. What is this? •	How long has MYGTech.com been in business? •	What restrictions do you place on you orders and can I order from you if I am under 18 years of age? •	What are your payment options? How do I pay for my order? •	How secure is my credit card information and privacy? •	Do you sell, trade or maintain any mailing or customer lists? •	What do you do with the information I provide to you? •	Is an invoice included with my order? •	What delivery options do I have? •	How soon will my order be shipped? How long does it take to deliver? •	How do I know when my order has been shipped? •	What do I do if my tracking number says my package has been delivered, but I have not received the package? •	What do I do if my order is damaged during shipping? •	What are you return and refund policies? •	The online shopping cart isn’t working. What can I do? Are MYG Mega-You-Grow products available anywhere other than MYGTech.com? F.A.Q.- No. The MYG Mega-You-Grow products are available exclusively through our online store. Products offered elsewhere that look similar to the MYG mushroom kits are not genuine MYG Mega-You-Grow products. Competitor copies of our products do not meet the high quality standards that we guarantee. Our products are the original MYG kits that have proven themselves to be the best available on the market. F.A.Q.- We ship our products to Canada only! How do you package and label your products? F.A.Q.- All MYG items are packed for maximum durability and product protection. Depending on your order, we may use single or multiple white or kraft colored rigid boxes. We value discreet service and use only plain, neutral packaging to ship our products. No product labels, description of contents or invoices are displayed on the outside of the packaging. Only shipping and return addresses are displayed. Can you ship the MYG products to PO Boxes? F.A.Q. - Yes. MYGTech.com can deliver products to any valid address, including a PO Box. The address you specify for shipping simply needs to be a working address which includes a Name, Street Address/PO Box, City, State/Province, Postal/Zip code, and Country. We also require a valid phone number to contact you with shipping details. What strains of mushrooms can I grow with the MYG Mega-You-Grow mushroom kits? F.A.Q. - The MYG MEGA-YOU-GROW mushroom kits can be used to grow a wide variety of edible and medicinal mushrooms. With just a few small variations in the growing process, you can cultivate almost any mushroom strain with the MYG mushroom kit. 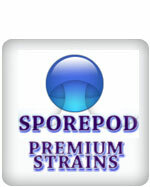 Our kits work seamlessly with the mycology strains offered through SPOREPOD.com, a reputable vendor of edible and medicinal mushroom species. How many mushrooms typically grow using the MYG mushroom kits? F.A.Q. - There are few variables that effect the productivity of your MYG kit. We have put years of expertise into developing the most fool-proof, productive kits on the market. There is a reason why we call our mushroom growing kits the MEGA-YOU-GROW. If you follow our detailed instructions carefully, you should be assured the most abundant harvest available, multiple flushes and an easy, enjoyable growing experience. My MYG mushroom kit has finished its first growing cycle. If I want to use my MYG mushroom kit to grow another crop of mushrooms, do I have to purchase an entirely new kit or can I buy replacement parts and refill kits? F.A.Q. - MYGTech offers individual items and kit components for sale, as well as MYG mushroom Refill kits. These single item products and Refill kits can be used to replenish your existing system and keep your MYG kit growing almost indefinitely. Can I order bulk quantities and do I get a discount for bulk purchasing? F.A.Q.- Yes. MYG Mega-You-Grow products are offered in bulk quantities at discount prices. To order bulk quantities, select your desired quantity from the drop down menu on your product ordering page. The corresponding discount prices will automatically be calculated and displayed. For wholesale inquiries please contact us directly. Do I need to sterilize my MYG grain jars before using them? F.A.Q. - No. The MYG grain jars are pre-sterilized under strict laboratory conditions. You do not need to perform any sterilization procedures yourself. Our grain jars are sterile and ready for inoculation. Working in a clean environment and following proper hygiene protocols when working with our products will ensure that you do not introduce any contaminants into your project. What is the best way to store my MYG grain jars, straw substratebags, casing soil and casing starter components? F.A.Q. - The MYG individual growing components should be used as soon as possible after you receive them. However, they can be stored for a limited time in cool, dark conditions. Please be aware that the MYG Quality Guarantee is valid for 30 days after purchase for these components. They are designed to be used FRESH for the best results. The casing soil in my MYG kit has white/grey patches in it. What is this? F.A.Q. - We use a blend of special ingredients to create our casing soil. The white/grey material in the casing soil is a key ingredient and essential part of the mix for creating a good casing layer. The lime often settles to the top of the bag during shipping. When ready to use the casing soil with your MYG mushroom kit or personal growing systems, simply mix it well to distribute the ingredients evenly. How long has MYGTech.com been in business? F.A.Q.- Our company has been manufacturing the best selling, leading home growing mushroom kits on the market since 1997. Our MYG Mega-You-Grow mushroom kits and products were previously sold through another online vendor. However, to offer you the best quality guaranteed products, the lowest prices and the freshest quality possible, MYGTech.com was launched in 2008 to meet the demand for high quality, guaranteed mushroom growing kits available direct from the makers at the lowest price possible. Our products are now available exclusively only from MYGTech.com - direct from the inventors, manufacturers, and original suppliers of the MYG Mega-You-Grow mushroom kit. What restrictions do you place on you orders and can I order from you if I am under 18 years of age? What are your payment options? How do I pay for my order? F.A.Q.- For your convenience, we provide multiple payment options. You can pay for your order online using Visa or Mastercard, by tele-phone using Visa or Mastercard, or by mail using INTERNATIONAL money orders. For complete payment instructions, please read our Ordering Page. How secure is my credit card information and privacy? Do you sell, trade or maintain any mailing or customer lists? F.A.Q.- MYGTech values your personal privacy and protection of such above all else. We do not sell, trade or release customer information to any parties. MYGTech.com may maintain customer lists for those customers who request to be notified with product updates and promotional deals. What do you do with the information I provide to you? Is an invoice included with my order? F.A.Q.- Yes. All orders are packaged with an invoice containing a detailed summary of your order and the order number for your reference. F.A.Q.- MYGTech.com delivery is via Canada Post. Please chose your preferred delivery option from the appropriate selection box during the check-out process. For alternate or overseas delivery options, please contact us before placing your order. How soon will my order be shipped? How long does it take to deliver? F.A.Q.- All MYG products are shipped within 48 hours of the completed and cleared order transaction. Orders placed with credit card generally ship within 2 days, and by international money order within 8 days. Delivery time varies depending on your location and your chosen delivery method. Expected delivery time is included in your shipping confirmation message. Items on backorder will be shipped immediately upon availability. F.A.Q.- A shipping confirmation email is sent as soon as your MYG order is shipped. A Canada Post Postal tracking number is included in the confirmation message. Please ensure that all contact information is entered correctly to avoid delay in confirming the shipment of your order. What do I do if my tracking number says my package has been delivered, but I have not received the package? F.A.Q.- Please contact our Customer Service Representatives, and we will assist you in filing a lost package claim with the shipper. To avoid any delay, we will be happy to arrange for a replacement order to be shipped out free of charge as soon as the claim has been filed. F.A.Q.- If your order receives rough handling and suffers damage during shipping, please contact us and we will be happy to arrange for a replacement of the damaged item. Our Customer Service Representatives will guide you through the return process and ensure your satisfaction. What are you return and refund policies? F.A.Q.- All MYG Mega-You-Grow products are covered by our outstanding Quality and Satisfaction guarantee. If for any reason, you are unsatisfied with your purchase, please contact our Customer Service Representatives and we will be happy to assist you with the return process for refund or exchange. Shipping charges are non-refundable. Please refer to our Return Policy for more information and further instructions. The online shopping cart isn’t working. What can I do? F.A.Q.- Our Online shopping cart is designed to work optimally with the Mozilla Firefox and Microsoft Internet explorer web browsers. Be sure to enable ‘cookies’ while shopping our site. The Online shopping cart system utilizes ‘cookies’ to keep your shopping cart information updated and accessible during your shopping session. To ensure you are browsing an active, loaded version of the site, try updating your shopping page by using the refresh tool in the upper bar of the web browser. For alternate methods of ordering, please refer to our Ordering information page. If you did not find your question answered in our F.A.Q.’S, please contact one of our Customer Service Representatives. We will be happy to address your specific inquiry.